By buying this product you can collect up to 66 points . Your cart will total 66 points that can be converted into a voucher of 13,20 € . Digital receiver high-performance, very easy to handle, intuitive. The receiver of Radiotracking converts the signal from the transmitter of electromagnetic radiation into an acoustic signal, and digital, which is used to identify the direction of the signal towards where to find the animal that carries the transmitter. Each pulse of signal emitted by the emitter is received acoustically from the speaker and visually by a bar smitter. · EASY-to-USE in any terrain. Manageable with a single hand. · Memorize UP to 100 ANIMALS (100 memories, but with over 2,700 channels). · Works with AA ALKALINE, standard or rechargeable batteries approved by Tinyloc, so if you run out of battery in a full field, you can change them instantly. · Automatic LIGHTING of the screen ( light sensor outside). · DDC: Offers an effective system of detecting the proper direction (DDC), which through the numerical values help to find the address easily, accurately, avoiding the problems associated with deflection, maximum on the ground. 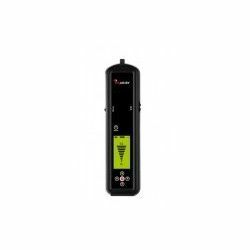 · CALIBRATION AUTOMATIC: automatically Calibrates transmitters, detecting any small variation in the frequency of it, to increase its performance. · A symbol on the screen that shows when the BATTERY LEVEL is low. · Supports transmitters of any manufacturer in frequency 432, 433 and 434 MHz. · Accuracy of 5 cm in the location of an emitter. 25-50 HOURS. Indefinite if it is connected to the cigarette lighter socket of car. Issuers radiotracking of any manufacturer in the frequencies 432, 433 and 434 MHz. Emitting radio-localization compatible with the receiver R1+. Where power and ease meet. The ideal combination for birds of more than 450 g Works with a battery type 1/3N, which provides an autonomy of 7 days. The detector low battery will alert us 2 days before the battery fully discharges, and it emits a double tone. · Your weight is 8.2 g, mounted upon a leg, and 8.7 g mounted to the tail (battery included). · The issuer, has LED light, that allows us to know at first sight that the transmitter is working. This system can be very useful in searches of the night. · In your version 433 MHz is the transmitter legal most powerfulthat currently exists in the market. Its tubular shape and its system of battery cap threaded, allows you to use it to paw or tail when their owner desired. Is available a version in 216 MHz for countries where that frequency is allowed. · Equipped with magnetic switch. Magnetic switch (magnet) and with the battery / Indicator LED power light. Radio receivers, tracking of other manufacturers in the frequencies 433 and 434 MHz. The briefcase includes by default 2 fixings: tail and leg. Alternatively, you can order the kit harness with the fixing. Description: Digital receiver high-performance, very easy to handle , intuitive. The receiver of Radiotracking converts the signal from the transmitter of electromagnetic radiation into an acoustic signal, and digital, which is used to identify the direction of the signal towards where to find the animal that carries the transmitter.